This is not only a book about watches. 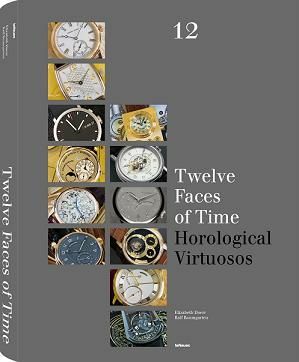 This is a book about the faces behind the watches made by horological master minds Philippe Dufour, Paul Gerber, Dr. Ludwig Oechslin, FP Journe, Kenji Shiohara, Kari Voutilainen, Vianney Halter, Beat Haldimann, Volker Vyskocil, Thomas Prescher, Roger Smith and Felix Baumgartner. I own and have read a great number of books on watches: books about specific brands, specific uses, specific complications and so on. For this reason, perhaps, I’m not sure this is a book suited to people with no interest in haute horlogerie; it is a book that suits the desire of many advanced collectors and watch aficionados to have more information on the subject. 12 Faces of Time is a book at a whole new level that what is already in existence, providing insight into the creative and inspiring minds of today’s watchmaking legends. This masterpiece of watch literature is certainly more than just a coffee table book. The authors of this book, Elizabeth Doerr and Ralf Baumgarten, did an excellent job capturing the personal stories and excellent (and most creative) photographs of these watchmakers in their own environments. The authors needed to travel to four different countries to be able to make that possible. If they hadn’t done so, the watchmakers likely could not have been portrayed in as they are in 12 Faces of Time, at ease and passionately speaking about their work. This is a unique book in many ways, but one thing that really sets it apart is the choice of the twelve watchmakers portrayed. These were carefully selected by the authors of the book, without any influence of marketing from brands or luxury groups. As an avid reader of watch magazines, I thought I would be able to name them all, but some of the names were new to me. Kenji Shiohara, for example, is one I had never heard of before, even though he has created some tremendous timepieces for Seiko’s mini-department of high watchmaking. The book includes a few legendary names as well, of course: Ludwig Oechslin, former creative head of Ulysse Nardin, and Francois-Paul Journe with his impressive FP Journe timepieces. Not only the interviews make this book worthwhile, the photos are also simply stunning. The interplay of double-page photograph spreads and smaller pictures is wonderful, and amazingly enough it doesn’t distract you from the text with its careful wording. When I finished reading this book, I caught myself screaming ‘wow! ?’ out loud. This has never happened before, and I immediately looked over my shoulder to make sure nobody else was there. Just to be sure. This book has a price tag of 79.90 Euro. More information through www.teneues.com.